Whether you’re an event organizer, a frequent dinner party host, or just someone who wants to be prepared in case unexpected guests arrive, you will find that folding chairs are a necessary item to have around. Folding chairs are the best and probably the only temporary seating option you can find. These are cheap, handy, easy to use, and so much more, especially when you know what to look for when searching for the best set of folding chairs to buy. The level of comfort offered by a folding chair depends on the type of material used to make the majority of the foldable chair. Currently, in the market, the most common materials used are plastic, metal, wooden, and mesh. There are some variations between the frame material and even the padding that all contribute to how comfortable and how light the folding chairs are. 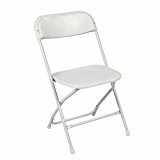 Plastic Folding Chairs are the cheapest and most commonly used temporary chairs for many occasions. They are very durable, versatile, and hold well against a lot of weight and pressure.They are also very easy to clean and are fairly lightweight that they are easily transported, stacked, and stored until needed. The downside to most plastic chairs is their comfort level. Without extra padding added to the seats and backrest, plastic folding chairs aren’t very comfortable at all. These types of chairs are best for practical and economic reasons, but hardly for comfort. Metal Folding Chairs are also affordable, but they aren’t as common or as popular as plastic chairs because they are a little heavier, a little harder to maintain, and also not very comfortable without added cushioning. However, folding chairs with metal frames are a little more durable and hold more weight than the plastic variety, which is why some people prefer metal folding chairs over plastic. They are also easy to clean and transport but are prone to rust when not properly cared for. Keep that in mind before choosing metal over plastic. Wooden Folding Chairs are the least popular type of temporary seating because they are very bulky, heavy, expensive, and require a lot of care and maintenance. These chairs are not in any way waterproof or water-resistant as the first two, but they rank a little higher on the comfort scale, even without fabric or vinyl padding. The most common reason why people choose wooden folding chairs is that of aesthetics. They are very classy looking and are the best type of temporary seating for formal events like weddings. Wooden folding chairs are also notably a lot more durable and stable compared to the other types of folding chairs in the market. Mesh Folding Chairs are technically a combination of plastic and metal components but deserve a category of their own. These folding chairs are considered as the most comfortable and also lightweight depending on the frame material used. The reason why they are comfortable even without any form of padding is the material used on the seat and the way the seat is designed. Most mesh folding chairs are designed with holes in the seats for better air circulation and added comfort. Another reason why mesh folding chairs are very popular even if they are significantly more expensive is the way the material contours the body when seated. The mesh material has the ability to morph into the specific shape of the person sitting which adds to the comfort. 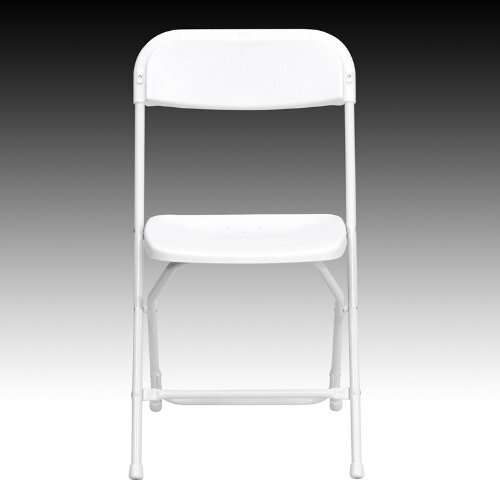 For the most practical temporary seating option, plastic folding chairs are your choice with metal as a close second. They are cheap, durable enough, very lightweight, and you can use them for both indoor and outdoor settings without any problem. Take note though that these chairs aren’t the best for occasions where guests are required to sit still for more than a couple of hours. 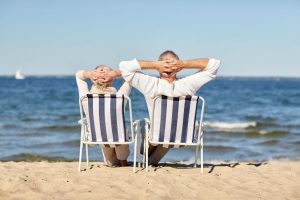 Plus, you may need to invest in some padding to increase the comfort level when using either metal or plastic folding chairs. 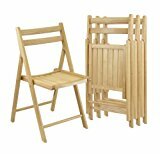 If you’re simply going for looks, the wooden folding chair is the best for you. It is more comfortable than the first two options, but it is bulky, heavy, and more expensive. For those who want to go all out and possibly use folding chairs as permanent seating at home can look into mesh folding chairs. They are very durable, comfortable, lightweight, and easy to store. If you’re planning to buy just a set or two for home use, mesh folding chairs are definitely the right choice. Everyone has attended an event where folding chairs were the choice of seating. This is mainly because folding chairs are handy, portable, and convenient as temporary seating choice and they have been since they were mass-produced back in the late 1950’s by the Frederic Arnold Company in Brooklyn. 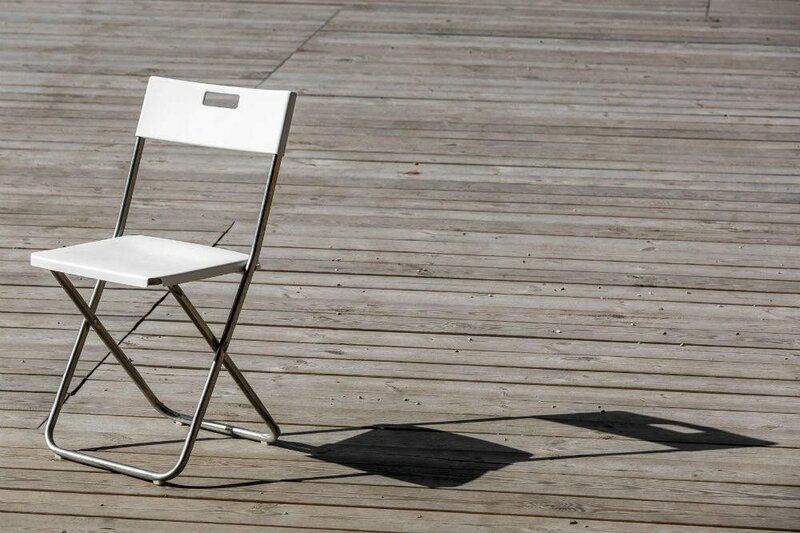 Back then folding chairs were exclusively made with aluminum, today there are now chairs made with all kinds of materials to make it more durable and user-friendly. Reliable, easy to use, easy to store, and affordable, the Cosco Resin 4-Pack Folding Chairs with Molded Seat and Back are a great option for folding chairs for your next celebration at home. Just because you don’t have a large enough dining table at home doesn’t mean you shouldn’t invite friends and family members over for holidays and other special occasions. Playing host during the holidays is fun if you’re up for the task, but it is also stressful trying to get everyone to fit into your home. Add the fact that you don’t have enough chairs for everyone, and that spells disaster.You can look into renting extra chairs for the occasion, but sometimes that isn’t practical and it is also costly. 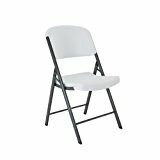 When it comes to a handy, reliable, and affordable outdoor folding chair the HERCULES Series 800-Pound Capacity Premium Plastic Folding Chair is a great choice. Even with just a little care and cleaning these chairs can last a long time! Back in the day folding chairs were only reserved for big gatherings and events. Today more and more homeowners have started to keep a few folding chairs in storage in case they need to grab a few when people come over for dinner or to celebrate an occasion. Entertaining a crowd doesn’t always mean you have to pay extra to rent chairs only to return them at the end of the day. Folding chairs are a great option for people who love inviting friends over for dinner, but don’t have the luxury of space or a large dinner table. 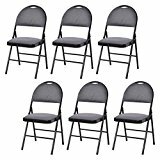 If you want to be ready at all times in case people come over this review will tell you all you need to know about the Flex One 4-Pack Black Folding Chair before you decide to purchase a set. 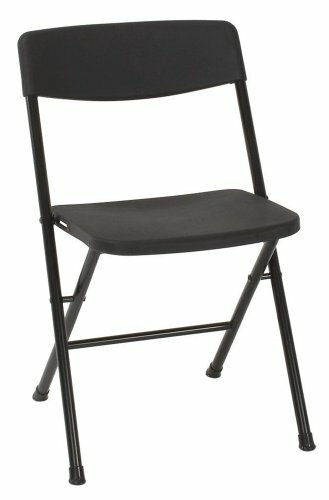 The Flex One 4-Pack Black Folding Chair is sturdy, reliable, and made in the USA. It is consistently ranked as one of the best and most comfortable folding chairs on the market, meaning it definitely is worth checking out. Big events like weddings require extra attention to detail even for the smallest of things. An experienced event planner knows how to find the things the soon-to-be married couple needs during their big day for less the price. One aspect of the event that you can help with is through the renting of temporary seats. It may seem like a big investment to make, but having your own folding chairs for rent saves you a lot of trouble and your clients a lot of money. Having a couple of Best Choice Products Commercial White Plastic Folding Chairs at home is a great and practical idea. They are affordable, reliable, and conveniently within reach on a moment’s notice. Having a few extra chairs around is always a good idea especially if you like hosting parties or just inviting friends and family to dine together. During small-scale celebrations like family gatherings, it is excessive to rent chairs for the night. At the same time, you cannot allow your guests to not have seats during the party. The best solution is to get a set or two of handy and convenient folding chairs. Lifetime White Granite Folding Chairs are the set you want to have when you like hosting backyard parties. They are worth the money you pay because they are well-constructed and last years even with constant use.They are the best choice for extra temporary chairs for both indoor and outdoor casual occasions. When it comes to the best folding chairs set, the choice is up to you whether you prefer plastic, metal, wooden, or mesh. To choose the right set, consider what the uses of the chairs are to ensure you get the best one that caters to your needs. Always keep in mind that folding chairs are only temporary extra chairs and are not meant for permanent furniture, this way you know what to expect when you purchase a set. I like the helpful info you cater in this article.Good luck for the next! 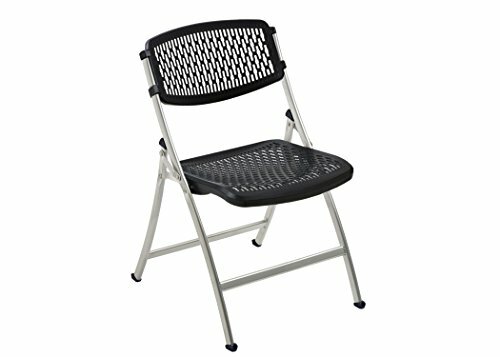 Where Can I Buy Cheap Folding Chairs? 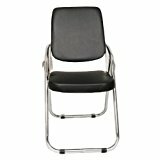 What is the Difference Between Folding Round Chair vs Folding Flat Chair? Some recommended products may use affiliate links. OpenBackyard.com is a participant in the Amazon Services LLC Associates Program, an affiliate advertising program designed to provide a means for sites to earn advertising fees by advertising and linking to Amazon.com. Amazon and the Amazon logo are trademarks of Amazon.com, Inc or its affiliates.